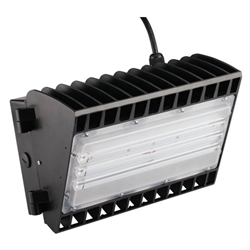 This 100-watt LED Wall Pack is great for both indoor and outdoor applications that require high luminous efficiency and a long working life. It can be used in a variety of settings such as workshops, warehouses, steel mills, gas stations, toll booths, waiting rooms, rail stations, indoor stadiums, flower cultivating tents, and more! Shop here to save on LED Wall Packs like the WSD-HWP10W27-50K and more for all of your lighting needs!